Custom Home Renovations For Home Owners In Delaware, Maryland and Pennsylvania - Davidson Homes Inc.
No matter the size of the project or the details involved, benefit from our decades of experience to get the job done right the first time, saving you time and money. Your home is in good hands. Put your trust in a Custom Renovations Company. Become one of our many local customers with our personal service, affordable prices, and overall value. We look forward to serving you! Davidson Homes, Inc is dedicated to your project and will take the time and effort to make sure that your requirements are met in a timely manner. Our team will give you the personal attention needed to get the job done right. We take the time to work with you, from shopping for materials to final walkthrough, to ensure your comfort with the process. 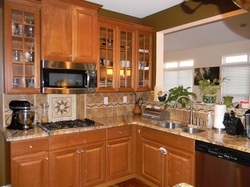 Your kitchen, bathroom, basement or addition is important to us. Our work is not considered complete unless you are completely satisfied. Please feel free to browse the photos of some of our work and be sure to read through the testimonials. You will see that Quality and Customer Satisfaction are our main goals here at Davidson Homes Inc. Once you decide to make us your contractor of choice, please call us, or send us an email. If you’re thinking about a remodeling project, you know you have a lot to consider: the scope of the project, the design and style of the new look, the budget you want to allocate, and most importantly who you’re going to hire to do the work. What you really need is someone you can trust to do what they promise, on time and within budget. We’d like the chance to show you how we can deliver just that. We believe our extensive experience, high standards for quality craftsmanship, personal approach and outstanding team members will make your next project the best experience you've ever had with a remodeling company.